I have had a few questions regarding, lumpy gravy, tasteless mashed potatoes, and lots of others. I decided even though it may be easy for some, sometimes the easy things can be the hardest to perfect. I think I was born with mashed potato and gravy knowledge! I have perfected my own recipes for this, and want to share them with you. Please do not expect to make mashed potatoes and gravy, heart healthy, fat free, low calorie or any of that. If you are totally concerned, skip this one and make something else! It is funny because before I was with my husband I would say no family meal would be complete without them. Now that my Italian mother in law has had all of our holidays, and made me really tap into my Italian heritage.....I would say no "non Italian family meal" would be complete without them. My husband being the Jersey boy he is calls it, "farm food"! Of course, his opinion doesn't matter, he doesn't particularly enjoy mashed potatoes and gravy. This marriage may not work out after all! I do not have a preference when it comes to the variety of potatoes, whatever you have is going to work. Maybe some work better than others but they all work! I hate peeling potatoes but its obviously a necessary evil. Wait! This is why we had kids right?!?! 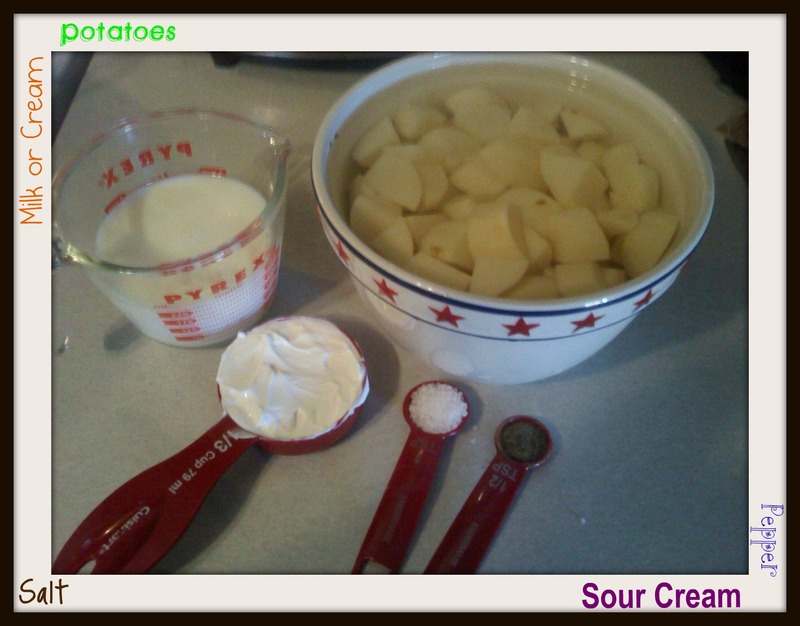 Make sure after you boil your potatoes you dump them back into your hot pot to let any extra moisture evaporate off. No soggy mash here! Some people smash, some mash and some whip. These are your WHIPPED variety, our favorite! Anyway I always get asked to bring baked mac and cheese and mashed potatoes w/gravy to meals I am not hosting, so here we go on your quest for the perfect ones! This recipe will serve 4 at least. Fill a large pot with cold water. Add potatoes and 1 tsp salt, cover and bring to a boil. Start checking at 15 minutes, to see if your potatoes are fork tender. When they are, drain well and put back in the hot pot. While they are cooking, in a small pot add in milk, salt, pepper, and butter. Heat to a simmer and turn off. Add to your drained potatoes along with your sour cream, and using a hand mixer, beat on low for 1 min and whip for 2-3 minutes. Yes WHIP. Don't skip this! Cover with lid, to keep warm until ready to serve. Now, if you use this for Thanksgiving, you will use your turkey drippings. I find it easiest to make it in the roaster but will give you the recipe for making it in a separate pan. (My photo will illustrate mine in the same pan I made my chicken in, so I could get the good flavor off the bottom.) Remove turkey from roaster and pour drippings from roaster into a bowl or measuring cup. Get out a saucepan large enough for the amount of gravy you need and lets get it started! In a large measuring cup or bowl combine COLD stock, parsley, cornstarch, pepper and poultry seasoning. Heat pan drippings in a saucepan to a simmer. Begin adding your stock mixture, whisking as you go. It will begin to thicken instantly. When you have added all of your stock mixture, continue whisking for 1 minute, pour into gravy boat and serve! I gave you the recipe using cornstarch as your thickener. For beginners I think it is easiest. Just remember, cornstarch can NOT be added alone to a hot liquid, it will clump and be lumpy. You add it to the cold stock first, whisk it and then add the mixture. You can also make a roux, 3 tbsp butter to 3 tbsp of flour, and slowly add in stock mixture minus the cornstarch. I prefer using cornstarch for a light colored gravy, it is just my personal preference. I always use a roux for beef gravy or white country gravy. Your gravy flavorings are also determined by what you have seasoned your turkey with or your meat of choice. If you have flavored your turkey for instance using some lemon but don't want lemon in your gravy, use all new stock, no pan drippings or your gravy will have a hint of lemon in it's flavor. I hope you enjoy one of the most famous sides of Thanksgiving! I know I will, and you can bet I will make TONS of extra gravy for the stuffin' muffins and the turkey! Thank you Christine for the recipe..I too love mashed potatoes and agree 100% that they are my favorite Thanksgiving side(I make plenty so I can have extra potatoes and gravy to heat up the next day). My mouth is watering just taking about it! !!!!!! Thanks for sharing!! I use some of the water I pour off the potatoes to help thicken the gravy. Learned from my mom and it gives it a nice rich flavor!! If you let it settle you can use the potato starch from the bottom of the bowl! Yum!! Sounds excellent! I make gravy different all the time depending on the situation. I just found this to be a very easy way for a beginner or someone who has trouble with lumpy gravy!!! I used to be a lumpy gravy maker back in the day! !